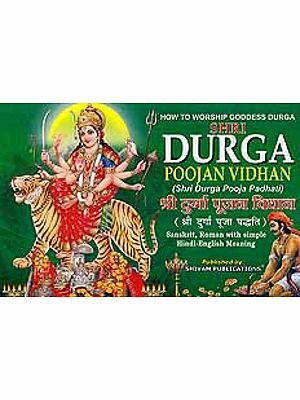 Durga Puja seems an all-too- familiar subject to write a book on as people from this part of the world get to live this gorgeous festival every year. Yet, the intimacy perhaps fogs the questioning eye, and the habit of taking the big picture for granted makes one unmindful of the smaller details. I have been lucky to be born in the Puja heartland, and the high point of my childhood autumns were enthusiastic performances with the Kanshorghanta (a percussion instrument comprising a bell metal plate and a stick) as accompanist to the dhaki (drummer) at the local community Puja pandal in Ranaghat, Nadia, about seventy-four kilometers away from Kolkata. I have been even luckier in getting a chance to prepare myself for a conscious distancing that the vital to arouse the queries that lie buried under years of unquestioning experience. Writing a script for a documentary film on Durga Puja and researching the subject for a series of festival- special articles for The Telegraph gave me the wherewithal to embark on this project. 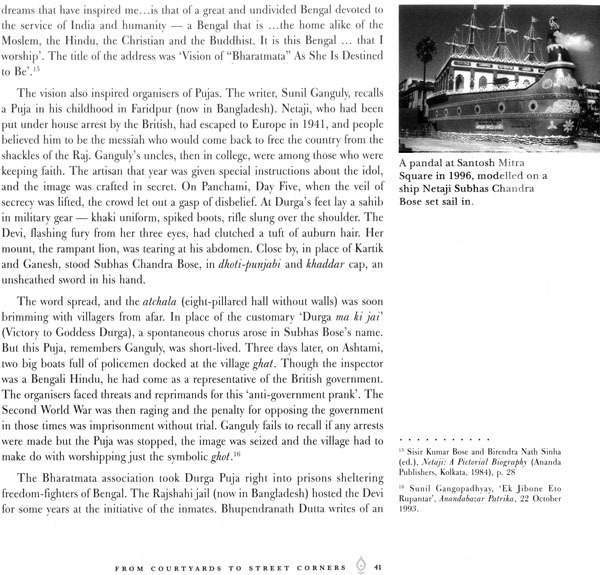 The book seeks to be an overview of the transmutation of the most spectacular phenomenon to emerge out of Bengal and spread its wings across the globe in the last century. 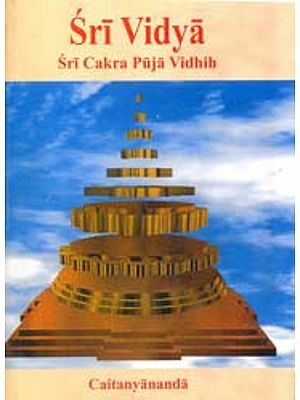 A store of information to help the researcher, a ready reckoner for the uninitiated, a collection of unknown answers to questions never asked for those who grew up with the Puja, like myself, and entertainment for everyone- this, in a nutshell, is what this book is. It does not pretend to be a scholarly work on the anthropological origin and evolution of the autumnal ritual. 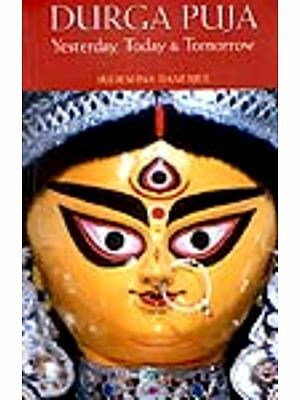 This book builds upon a paperback edition, entitled Durga Puja: Yesterday, Today & Tomorrow, published by Rupa in 2004. 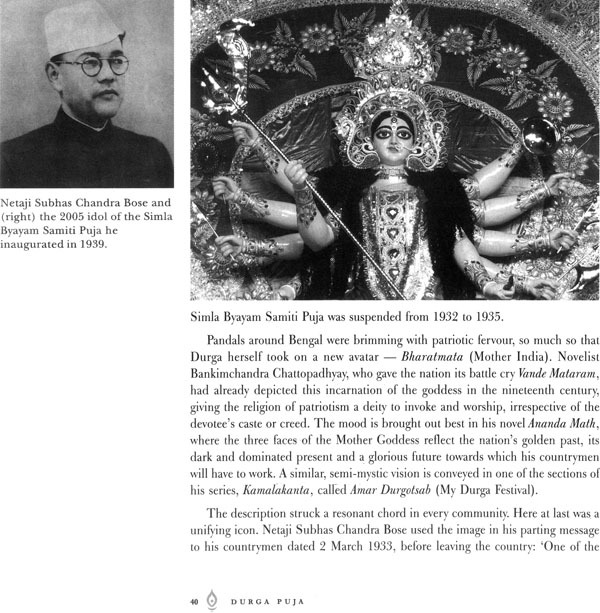 The book is an introduction to Durga Puja, the grandest festival in eastern India, a celebration that provides a glimpse into the rich cultural heritage of Bengal. 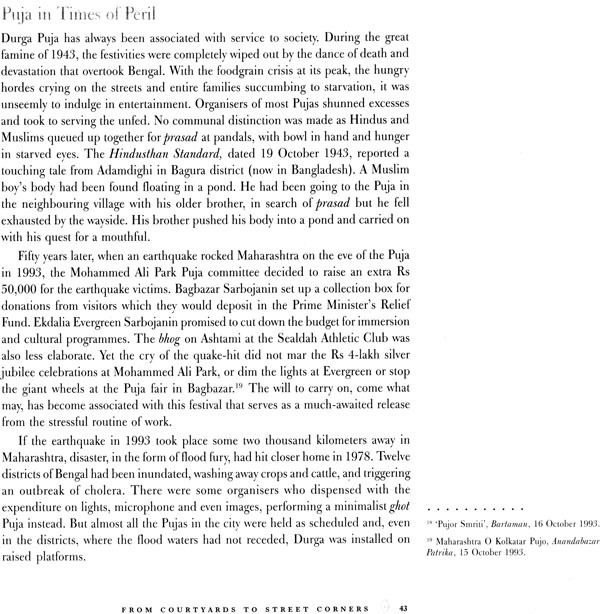 It is a ready reckoner on all aspects of the Puja- its mythical origins, its socio-cultural evolution, its economic ramifications and its elaborate rituals. The book traces the shift in calendar of a spring ritual to an autumnal slot with Lord Rama's Akalbodhan, with sundry asides thrown in (like, why is the mouse so dear to Ganesha?). It explains, in crisp and compact language, the main rituals to unravel the mystery that the priest's mantras are to most. 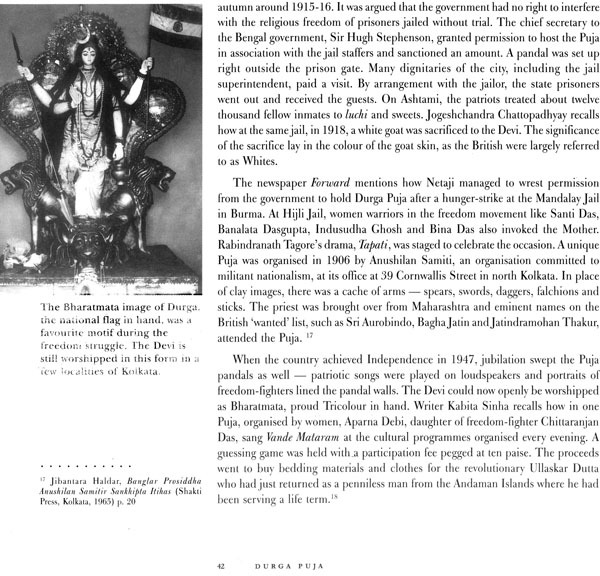 The best aspect of the book is perhaps the journey back in time to the Pujas of the babus during the British Raj. 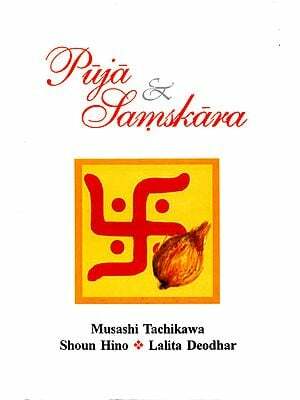 Spiced with anecdotes culled from journals and newspapers of the eighteenth, nineteenth and twentieth centuries, it is an entertaining read that provides rare glimpses into the past, like the menace of the collection of Puja subscription two hundred years ago or the way the Puja was used by freedom- fighters as a cover. The book also looks at the trends that make the modern day Puja- the commercialisation, the contests and the emergence of themes, and how Pujas abroad are different from those at home. 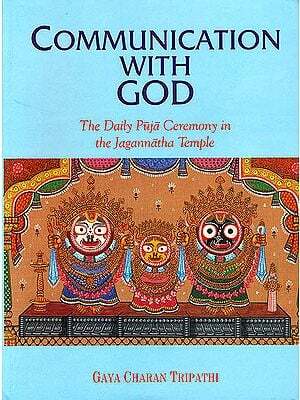 The conclusion logs on to futuristic trends, making the book a unique compendium of knowledge associated with the worship of the Mother Goddess, one of the oldest surviving Hindu traditions. Sudeshna Banerjee is a journalist. She started her career with The Asian Age and moved on to The Telegraph, a newspaper with which she is currently employed. A post-graduate from Jadavpur University specializing in English literature, Sudeshna has been writing on Durga Puja for years and has also produced the script for a documentary film on the festival. She is also proficient in French and has worked on several translation projects. A keen traveler, photographer and collector of stamps and coins, Sudeshna lives with her family in Kolkata. 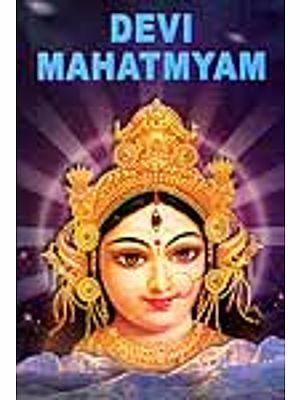 She can be reached at Sudeshna.